How do we handle Windows 10 (Threshold 2) Questions? So the release of Windows 10 on July 29th 2015 was known as Threshold 1. The current release is the Threshold 2 build. It was released on November 12th 2015. Threshold 2 bring several specific enhancements to Windows 10. Some of those things are not possible in build 10240 (Threshold 1). An example of this would be installing Windows 10 with a Windows 7, Windows 8, or Windows 8.1 license key. There are some other generic improvements that also come with Threshold 2. In the end there are several major and minor things that make these two builds different enough that warrant separate tags. I feel this is an important to decide, because when the next update, Windows Anniversary Edition is released Microsoft Edge will support extensions. So any answers to questions about Microsoft Edge today might not apply to a user running Windows 10 Windows Anniversary Edition in a year. It will be possible to defer Windows Anniversary Edition and Threshold 2 for a period of time on Windows 10 Professional and Windows 10 Enterprise installation. So although these updates are "required" there is still a legitimate need to separate questions even if we are only applying these changes to old questions asked before these updates are released. So how do we separate Windows 10 questions? This same question can be applied to the next updates Windows Anniversary Edition in 2016. Looking forward the changes between these builds, will be as different as, Windows 8 and Windows 8.1 are to one another. As somebody who performed the update to Threshold 2 I can say to the end user, it appears that Windows 10 is being installed again, so this is a major update. This isn't as simple as installing a service pack. 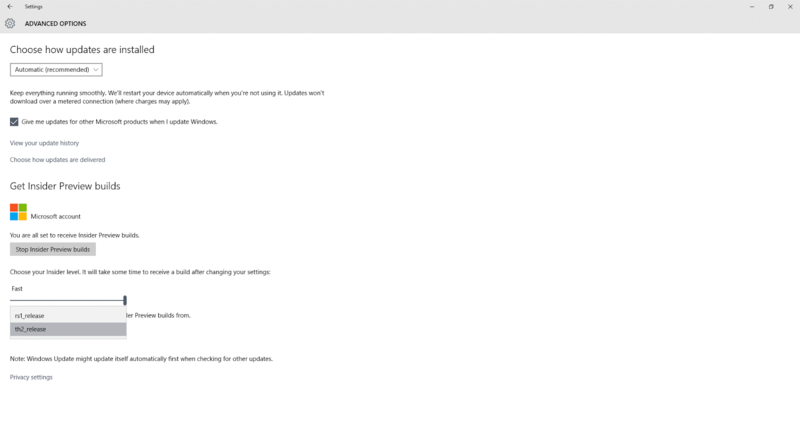 So my suggestion would be to rename the current Windows-10 tag to Windows-10-TH1 and update the description. Now that Threshold 2 is officialy released we should create a Windows-10-TH2tag and update the description to indicate the difference between the two releases. I feel this would would be similar to the Office-XXXX tags we have currently. Below is a screenshot of the next Windows Insider branch (RS1_Release) which is believed to be the Windows Anniversary Edition aka the Redstone branch. Threshold 2 is known as the Fall Update which will be reported as Windows 10 Version 1511 (for 2015 November) and and likely be the 10586.3 build. Consistency would be that we treat these the same way as we would windows8 and windows8.1 and have a new tag for each major(ish) version. What to name those tags though is the question. windows10-th1 and windows10-th2 lacks a certain je ne sais quoi as a tag, but as Microsoft isn't naming them something more relevant such as SP1 or 10.1 then it's the best we can really do. If the question is relevant to all versions then the base windows-10 tag would be preferred. I had been hoping that these would sound a lot more like real releases than minor feature packs. Aren't they all using Windows 10 anyways? Why must we use the reductio ad absurdum with tags when there isn't any actual gain for asker and answerers? People can't even tell whenever their question is applicable to only one or another version, nor should we hope they know, which would just put more pressure on knowledgeable to fix the tagging (or at least, try to), without any actual benefit of such chore. And guess what, they will not replace the tags, anyways. In the end Microsoft will push forward the update/upgrade to all their users for "security reasons" and the point will be reduced moot by then. Answerers should just presume the asker is using any version of it, and answer with the method is applicable for all iterations. I mean, installing software would be the same for years to come, no? Windows 10 Threshold 2 Update Failed - BSOD: MEMORY_MANAGEMENT BSOD that actually had nothing to do with this Windows 10 interaction, but third party software preventing the upgrade to the referred iteration. The user didn't even reached to upgrade his Windows. https://superuser.com/questions/1001666/what-does-installed-on-date-in-programs-and-features-mean This is something that it's shared on all versions of Windows 10. Ramhound itself also recognize this. It isn't relevant to what version of Windows 10 you upgrade, all versions will have the same behavior. Windows randomly drops half of connection This is very unlikely to be a Windows 10 v1511 specific issue, in fact the issue happens since Windows 7! (I edited the question to remove version specific tags, as it's likely a hardware issue). Icon for Chrome missing after updating Windows-10 to November Update 1511 Unlikely a issue specific to this version of Windows, very likely that the icon cache somehow got corrupted. The icon cache is in the same path for Windows 7, 8 and 10. Changing Chrome icon on the tile Unlikely a Windows 10 v1511 specific issue. Personalizing icons can (and are) a drag on any version of Windows. Having a single "How can I personalize application icons?" canonical post for all Windows would be recommendable, through in this specific case was another cache staling issue, non specific to this Windows itteraction. Local UNC paths through virtual switch failed after Windows 10 Pro update to 1511 Through the update seems to have messed up OP networking, in fact, this can happen with any update of any kind (on any OS), and for OP's specific case, it wasn't even that different solution compared with other Windows 10 installations. Unable to activate Windows 10 with error 0xc004f210 Activation issues are never version specific, and given the most likely assumption, the version being v1511 or not doesn't affect how the issue came to be nor it method of solution. All in all, none of these questions benefits from having an extra tag, and in those cases where it would make sense, the issue isn't even related. Not the answer you're looking for? Browse other questions tagged discussion tags windows-10 . What will happen to the Windows-8-Preview tag once Windows 8 goes live? Let's get started with Windows 8! When would editing or adding the 'regular' windows 8 tag be appropriate? Questions about beta/pre-release software. Why are there still 73 questions tagged [Windows-8.1]? What to do about the Windows Insider Program? Should the `windows` tag be used in conjunction with a tag of better specificity? What's our threshold for profanity in comments?